Cooler weather, autumn mountain views, great food, and superb local talent combine for the 100% Local Music Festival. The music festival will take place October 12th in the Peterson Amphitheater at Tryon Fine Arts Center. The celebration starts at 5:30pm, with a food truck from Mountain View BBQ, beer, wine, and concessions on site. Music will start at 6:00pm. “This is the perfect opportunity for folks to come over after work and unwind for a while and enjoy these great fall evenings,” said TFAC Executive Director Marianne Carruth. Performers include Zendetta, Rich Nelson Band, and Yondur. The groups feature some of the Foothills’ favorite artists and cross a range of genres and styles. The Rich Nelson Band plays the 100% Local stage featuring Rich Nelson on guitar and vocals, Stephen Cohen on bass, Robert George on drums, Bob Bencze on keys and Tim McCall on guitar. This is the first performance for this new line up of experienced rockers. Jazz trio Zendetta performs a little of everything with Hammond B3 Organ master Jim Peterman on keyboards, Vinny Corda playing Flute, Baritone and Alto Saxes, and Marco Noto handling the drum kit and whatever else he can get his hands on. Yondur (a Southern tongue-in-cheek variation on San Francisco’s Furthur) is a fairly new musical outfit featuring Jeff Haslam on lead guitar, Woody Cowan playing bass guitar, Lee Holroyd on the drums and Zon Lowe on rhythm guitar. Keyboard virtuoso Jim Peterman who will join them for their 100% Local set. The performers hail from Tryon, Saluda, Landrum, or Columbus, and have a special connection to the region. 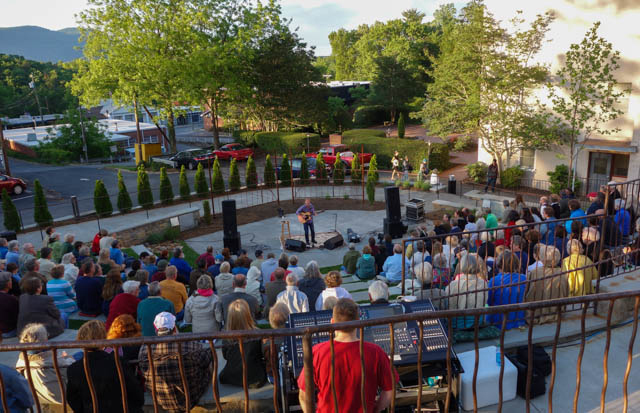 “TFAC regularly draws talent from around the country and across the globe, so we wanted to use the fall amphitheater series to celebrate the talented artists that are right in our backyard,” said Carruth. The 2018-2019 Peterson Amphitheater Series is sponsored by the Plume Family Foundation.